alaTest a collecté et analysé 11 avis de consommateurs et d'experts pour le produit Flip Video Flip UltraHD 8GB Camcorder - Black. La note moyenne du produit est 4.5 sur 5, tandis que les autres Caméscopes ont une note moyenne de 4.0 sur 5. De nombreux avis apprécient la portabilité. 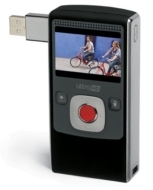 Après analyse des notes de consommateurs et d'experts, de l'âge du produit ainsi que d'autres facteurs, et comparé aux autres Caméscopes, le Flip Video Flip UltraHD 8GB Camcorder - Black obtient un alaScore™ de 80/100 = Très Bien. I was so excited to order this item and just recieved the UltraHD NOT the MinoHD as advertised here. I have to send back the Ultra and should be getting my Mino soon. I brought it for my husband for Christmas and it has worked excellently!!!!!! I Love it because it's so nice to put in your pocket or purse. Takes a very clear picture and it's easy to down load. Quality of recording is first class, easy to use. Second one I have bought and this model is far superior. great pic can't wait to get the uderwater cover...... the picture is out of this world..
the videos I took was all clear. It is easy to download videos on your computer. It is handy and light that I carry it on my bag , I only wish you can take picture while doing videos.